To mark Martin Luther King Day, may we recommend an excellent playlist to help celebrate the memory of the great civil rights campaigner? The 10-track list has been compiled by our friends at Concord Music, and features a weighty and immensely uplifting selection of poignant music, old and new, from their catalogue, collectively called Songs of Protest and Progress. 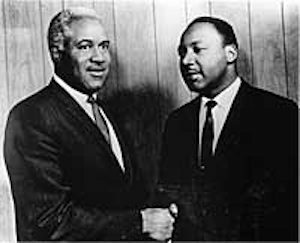 Fellow musical spokespeople of the civil rights movement such as Clara Ward and the Staple Singers are also represented, along with modern-day artists who have always worn their social conscience on their sleeve. The playlist begins with an exciting new gospel-flavoured release by Southern Avenue and also features ‘Got Me Accused,’ from seasoned southern soul man Bobby Rush’s current, Grammy-nominated album Porcupine Meat. Never forget Martin Luther King Jr.’s legacy.